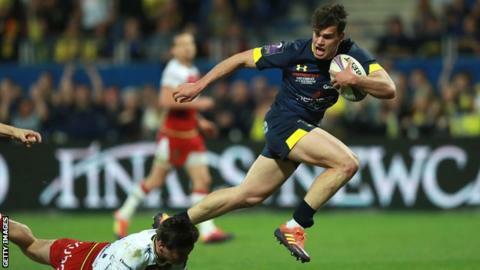 Northampton's European Challenge Cup ambitions were ended in France as Clermont held on to beat Saints in an astonishing 13-try quarter-final. The hosts led 22-3 at the break, Peter Betham and Damian Penaud crossing before Saints conceded a penalty try. Saints battled back from 30-3 down after 51 minutes to get to within six points with 13 minutes remaining. But late tries, as Penaud and Betham completed hat-tricks, sealed a 61-38 win and a semi-final with Harlequins. Victory for the two-time tournament winners was Clermont's third against Saints this season, having twice prevailed in the group stage. The win against the newly crowned Premiership Cup champions also extended their fine winning run against English opposition in the Challenge Cup, having now triumphed in all eight of their home games against Premiership sides. Morgan Parra gave the host the ideal start, putting them ahead with a penalty inside two minutes. A remarkable try-saving tackle by Peceli Yato on Cobus Reinach denied Saints the lead soon after, but a penalty from Dan Biggar did restore parity on nine minutes. Tries in quick succession from Betham and Penaud came after Parra had again given Clermont the lead with the boot. The pivotal first-half moment, however, came when Taqele Naiyaravoro sparked a melee, earned 10 minutes in the sin-bin and conceded a penalty try after barging Arthur Iturria into touch with a no-arms tackle. Ahsee Tuala grabbed Saints' first try in between further efforts from Betham and Penaud, but it was Luther Burrell's score after the hour that gave Northampton genuine hope. Alex Mitchell and Rory Hutchinson scores made it 37-31, but a flurry of tries from Tim Nanai-Williams, Betham and Penaud sealed victory, with Alexander Moon grabbing a fifth Saints try as a consolation score for the visitors. Clermont Auvergne: Nanai-Williams; Penaud, Betham, Naqalevu, Raka; Lopez, Parra; Falgoux, Kayser, Slimani; Timani, Jedrasiak, Yato, Iturria, Lee. Northampton Saints: Furbank; Collins, Hutchinson, Francis, Naiyaravoro; Biggar, Reinach; Waller, Fish, Hill; Ratuniyarawa, Moon, Lawes, Ludlam, Harrison. Replacements: Marshall, Van Wyk, Franks, Gibson, Brussow, Mitchell, Tuala, Burrell.